Practice Area: This course has a decent-sized putting green, but I've never noticed a chipping area or driving range. Description: Larkhaven is an older course with a laid-back atmosphere. This course and Charles T Myers (about 5-10 mins away) are two of the friendliest courses around town for beginners. 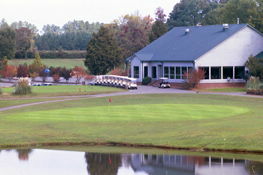 The course features tree-lined, rolling terrain and has its share of creeks and ponds. It often plays more difficult than its rating, at least until you get used to the nuances of each hole. The rates here are among the most reasonable in town. Notes: This course is scheduled to close in the Fall of 2018 and will be developed. Some of the changeover work has already started and several holes are affected. If you liked this course, plan one more round to say goodbye. B-Man's Take: The course is challenging and the layout can be fun. With its lower fees, it can be a great value. Beware, however, you do get what you pay for in terms of green and fairway conditions. There are many likeable holes for me on this course because each one is so unique. You start on a short, drive-able par 4 with an elevated green. The 9th hole is par 3 over water with the tee boxes a hundred feet above the green. The 17th hole is a par 5 that rolls downhill, then has a final approach over a pond. A few holes have teeth, like the long, dogleg right par 4 #4 with an elevated green. The dogleg left par 4 #10 has well-positioned fairway bunkers and a creek protecting the green. 11/4/18 - Msg Board Posting by The B-Man titled "One month left to play Larkhaven"